The temperature is 11C / 52F. However, the forecast is for a high temperature this afternoon of 25C. Quite a warm up. Yesterday, “le dimanche 13 août”, two French people stopped to talk to Sandy and ask her a question. The first gentleman stopped her on the way to the “recycling” deposit area. He saw that she was carrying one of the city yellow plastic bags and asked her if she was going to the “poubelle” area (garbage can). She said “oui” then he proceeded to tell her it was full and ready to explode. She wasn’t sure what it would look like when she arrived, but he was correct in saying it was full! She left her bag tied together and leaning against the recycling container as a few other people had already done. The other person stopped her just as we exited the bus yesterday on our way to the craft fair. She asked where you caught the return bus to the Intra-Muros. Sandy gave her the answer. She then asked if we knew anything about the craft fair. Phil replied, yes we had been there at least 3 times. It has more jewelry than we prefer to look at, so it does not take us long to look around. Today, we took the 8h40 bus to Intermarche. We finished our shopping and were back on the bus at 9h30. It is a gorgeous day! The temperature is very nice, sunny, and breezy. We have all of the windows open and there is a wonderful breeze blowing through. No grassy smell, no farm animal smell, just clean air! Sandy hung clothes to dry on the balcony and began to clean the outside window sills and window frames. Last year we bought pancake mix from the “Maison du Quebec.” We still had some so Phil made pancakes for our lunch. They are similar to buckwheat or whole wheat pancakes in the USA. They were delicious! After lunch we watched our friend Alain play boules by the ramparts. It was a beautiful afternoon. On our way back to our apartment we followed a man with a tiny dog in his backpack. It is very common to see French people with their dogs in a purse, or recyclable sack. This backpack was specifically made to carry a dog. The dog appeared to be a Yorkie and looked very content not to risk being stepped on by people. Today is a French national holiday based on the Catholic holy day of the Assumption. The buses will run on a holiday schedule (less frequently) and there are many more people in town. When Sandy returned to our building after buying our croissants, the man who is renting the ground floor apartment was standing outside in his night-shirt. This was at 8h45. He is older than we are and quite rotund, so it was quite a shock and not a particularly attractive sight either. Sandy shopped at the marché and bought flat peaches and green plums. They taste very good. We walked to Saint-Servan along the beach to the “Tour Solidor”. On Tuesday they hold a flea market and antique market. It is a lovely spot to view another harbor. While walking back towards the Intra-Muros we spotted a bicyclist holding a dog on his lap, towing a small wagon with two more dogs inside. It was very cute and they sped by so quickly we didn’t have time to take a photo. After lunch we watched our friend Alain play boules. Some of his team were the same teammates as yesterday and some were new. We do not understand all of the scoring or rules. A lovely afternoon with perfect temperature and sun! The forecast high temperature is 25C / 77F a great beach day! High tide is 14h06 this afternoon, so by 16h00, there should be enough beach to walk in shallow water. Sandy shopped at boulangerie “Simon” for our breakfast. They also have some of the most beautiful and delicious pastries. She bought a “Royale choco-pistache” dessert to have after dinner tonight. Look at the lovely box it is put into for carrying home as well as the dessert itself. A lot of effort goes into each lovely piece. She had to wait a minute to pay for our breakfast because the patissier / boulanger was making and labeling some pastries to go in the oven. He put the tray into the oven, closed the door and waited on her. We had all of the French doors and windows open in our apartment and it was a fabulous day for drying laundry. After lunch we watched our friend Alain play boules by the ramparts. Then we walked towards the mole (breakwater with a lighthouse) to look at one of the beaches. We had thought about walking in the water but it was not hot at all today, so we enjoyed watching boats come and go in the harbor. We will save the ocean for a warmer day. ” which is a delicious cut of steak, 2 slices of ham for sandwiches, and “farce a tomato” which is the stuffing that comes in stuffed tomato here. We are very fond of tomato farce and often buy yellow or orange peppers to put the stuffing in. We took a photo of some of the “rilliettes” and other aperitif food sold by our butcher. We saw a cruise ship, the Star Legend,s had come into the basin through the locks early this morning. It is from the Windstar line in case anyone wants to cruise to Saint-Malo. Sandy got an early start by shopping at the marché before 9h00. She bought some fruit and some green beans. It is our day to tutor with Christine. We stopped to talk to Christine’s neighbor on the way to her house. He likes cats and said his cat is 21 years old. He was very friendly again today. Michel, Christine’s husband, had rented a carpet shampooer and was out on the terrace shampooing the dining room and living room area rugs. After lunch we went to the pharmacy to refill prescriptions. We found out the pharmacy has been sold. The owner “Philippe” has sold the pharmacy to the owner of the pharmacy by the Cathedral. We do not know if our pharmacy will remain open or if it will close. We will find out next month. The sale date for the pharmacy is 31 October. Another change!! The afternoon was forecast for rain, but the sun was shining, the sky was blue, the wind blowing and it was gorgeous! About 66F / 19C. It had rained earlier this morning and was 13C / 55F. Quite cool! 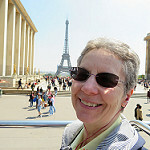 As Sandy walked to the boulangerie to buy breakfast she noticed many people wearing rain jackets and carrying umbrellas. There wasn’t even any rain predicted. Weather constantly changes when you’re near the ocean. Every table was full in the boulangerie. Perhaps a ferry had just arrived from the U.K. or the Channel Islands. She could hear a lot of British English speakers enjoying their tasty French breakfast. We walked to the Rocabey post office to mail a letter and took the bus home. We stopped in to say “bonjour” to our friend Jean-Louis at his boutique. After lunch we watched our friend Alain play boules by the ramparts and then walked to the harbor to look at the boats. The day had alternated between clouds and sun all day. At one time we even saw it rain really hard for about 30 seconds. The day ended with beautiful sunshine and breezy coolness. Sandy purchased lovely looking desserts when she shopped for our breakfast. They were purchased at “La Fournee Malouine” and cost 2,50€. They were an euro less expensive than she paid at the other boulangerie/pattiserie earlier in the week. We walked across the ecluse/locks and along “la plage des bas-sablons” to the “Solider Metier des Arts” which is a yearly art fair. One of the exhibits used wooden shoes as part of the art. Sandy didn’t think she would see wooden Dutch shoes in a French art fair! Funny! The weather was perfect! No jackets or umbrellas needed today. After walking round trip, and browsing we were ready for a cold drink at Charley’s Bar. Sandy had an Orangina and Phil had grenadine syrup with water. Orangina and other soda type drinks are tastier in France. They are less sweet and taste more like the fruit they are made from. We had the lovely desserts after our mid-afternoon dinner. Monday August 8, 2016 and it’s raining when Sandy walked to the boulangerie for our breakfast croissants. The chance of precipitation for today was 0%, but a rain cloud must have blown in from the sea. The sun appeared before noon and the temperature high for the day was 20C or 68F. We took care of housecleaning chores in the morning. Sandy can’t reach the top row of windows on our french doors leading to the balcony. She asked Phil to wash them today. Phil heard many people coming and going in their cars as he was back and forth between the living room, dining room and balcony as he washed the glass panes. Tuesday August 9, 2016 is sunny but cool. The high temperature was again 20 C or 68 F. Sandy wore slacks and a jacket when we took the bus to Carrefour at La Madeleine Center. We left our apartment at 8:35 this morning to try to avoid tourists and crowds. We arrived at the store a couple of minutes after they opened. We purchased all of our items, checked out and were waiting at the bus stop in less than 50 minutes. However, we purchased so much that Sandy had two reusable shopping bags and Phil wheeled our “cart” which seemed like it weighted 40 pounds! We hadn’t been shopping except to pick up an item or two for a few weeks and we made up for it today. In the afternoon we picked up prescriptions from the pharmacy then headed to the harbor. The tide was on it’s way out. We watched jet skiers depart and several Corsair ferries arrive and depart. We walked out to the end of the Mole Noir (breakwater) and decided that was enough sun. The water was a beautiful emerald color (Cote de Emerald) and many people were enjoying the beach and sea. It was odd as we walked on the mole and looked down into the water, to think that just the other day, we had walked in the sand around the same structure. You get a different perspective from walking on land and then walking where water covers the same spot. Beautiful day at the harbor. Condor ferry and Corsair ferry in the background. An interesting sail on this boat. Beautiful day at the beach; sand, sun and surf. Wednesday August 10, 2016 we walked to the Médiathèque La grande passerelle Saint-Malo. It was sunny and cool. Sandy chose a few books written in English and a few children’s books written in French. She found the book by Kevin Henkes, titled in English as “Wemberly Worried”. In French the title is “Juliette s’inquiète”. Interesting to compare the words from each edition. In the afternoon it was still too cool to comfortably enjoy the sea, so we took a walk back out to the Mole and enjoyed the harbor. The sun was hot when it came out from behind the clouds but the fresh breeze kept us from feeling uncomfortable. Thursday August 11, 2016 is very cloudy. It looks like it will rain any minute and looks as if it’s time for the street lights to go on in the evening. By the time we took the bus and walked to Christine’s house for tutoring the sun was shining. No rain in site! As we waited for the bus to return to Intra-Muros the electronic sign told us we’d only have to wait 9 minutes. However, the bus didn’t arrive for 20 minutes. This was the longest wait time we’ve ever had. Good thing it was a cool day. We even had to sit in the sun to wait for the bus because the wind was so strong. In the afternoon we walked out onto the Mole. There were two cruise ships in the harbor (Insignia and Crystal Symphony) and another cruise ship (Star Legend) in the basin. All five of the Corsair ferries were operating, the Condor ferry arrived, and there were many sailboats, a few jet skis, and pleasure craft on the water. Very busy and interesting to watch all of the people etc. We wanted to listen to the chants de marin (sailor songs) where the vocal group the Corsairs Malouins interpret sailor songs of yesterday and today. We love to eat kebab’s at Chez Marcel’s and thought we’d stop there, take our kebab’s to eat at the park then listen to the vocal group. What a surprise! The line was out the door and would have probably taken an hour for our food. We walked over to the (new in 2015) Fish and Chips shop and decided to give it a try. The food was ready in 10 minutes, the staff were very friendly, and the food was delicious! We had to find a spot outdoors to eat where the wind didn’t blow quite so hard because it was so cool. We decided to wait until next Thursday to listen to the vocal group because it was so cool. Try to remember how cool we felt this evening over the next few days. Friday August 12, 2016 is sunny, with a nice breeze, and cool. The high temperature was 22 C or 72 F. We walked to Saint-Servan to purchase meat from the butcher. While Phil was in line, Sandy bought blueberries from one vendor and black olives from another. The lines weren’t too long and we walked back home without bridge or pedestrian delays. Also this weekend is the Brainiebas de Regates a St. Malo La mer en Fete!. This regatta takes place between Saint-Malo and Cancale and includes two days of boat parades at both locations. More information can be found here. Saturday August 13, 2016 We took the #8 bus down to the Kennedy stop which is the north end of the Digue, and walked in the water with our beach shoes back to Intra-Muros. The walk was about 2 miles and a wonderful, lovely, cool walk. Very invigorating by not lifting your feet our of the water. We saw quite a few jelly fish that looked like brown striped and spotted hot air balloons, and two dinner plate size white/clear jelly fish. Sandy stayed clear of them! Walking in the water on the beach at low tide. Our walk in the water on Saturday August 13. Sunday August 14, 2016 we walked on the beach from Porte Saint-Thomas near the castle, more than halfway to the north end of the Digue and back. As we walked around the only piling of rocks Phil spotted our friend and notaire Eric. How funny to see someone we know!. In the afternoon, we were able to FaceTime with our son Michael and hear what’s going on with him. Winona, apparently, is doing fine without us.